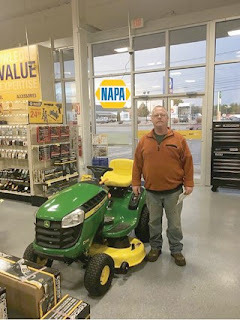 At the NAPA Auto Parts Store in Windham, Maine we recently remodeled the store with a new look and new products. we held a drawing for a new John Deere riding lawn mower. The model was a D110 from Hall Implement Company. Everyone was welcome to come in and sign up with no purchase necessary. We drew a winner on May 1st and we are pleased to announce that Donald Spinks from Windham, Maine was the lucky winner. He came and picked up the John Deere on Saturday. To continue this appreciation, we are also giving away a small ATV (holds up to 167 lbs) from Windham Powersports. Again any person can come in and register to win!